EBONYI— The Uburu community in Ohaozara is a town where most of the political giants like the current serving Minister for Science and Technology, Dr. Ogbonnaya Onu and the sitting governor, Dave Nweze Umahi hails from alongside numerous political office holders. It is a large autonomous community with forteen villages and numerous kindreds. It is the source from which Ebonyi state was nicknamed "SALT OF THE NATION". This is because of the salt lake which was located at the middle of the city referred as the 'Mmahi' by the locals. But unfortunately, these political jobbers who hailed from this naturally endowed community were hellbent on pleasing their Hausa/Fulani paymasters and political associates at the expense of the freedom of their own people through their rigorous campaigns for one indivisible Nigeria, mainly because of their selfish-centeredness. Recently, the attention of the Biafra Writers team was drawn to the mischievous activities of the Ebonyi state governor towards the Biafra restoration struggle, who vowed that he will not tolerate any IPOB activities in his state, especially at Uburu his hometown and ever since, has been working tirelessly to making sure he kept to that promise in order to please his slave masters. A recent report sent to our news desk from a very reliable source, disclosed that on Thursday, August 10, 2017, the governor, Dave Umahi, summoned representatives from all the forteen villages in Uburu at the Community Secondary School, formerly known as Central Primary School, Uburu and encouraged the people to do all they could to prevent the coming of Biafra so that he could be able to finish his second term in office come 2019. According to the report, Governor Umahi, promised Uburu people that he will continue to be nice and kind to them only if they stick to the conditions of not belonging to any Biafra freedom fighting group especially IPOB. He distributed some monetary gift to the tune of 200,000 naira each to the people of the forteen villages and also to the youths of the villages, promising to do more if they would abide by the rules and conditions. According to the lady who does not want her name on print, she revealed that a lot of prayers was also conducted at the venue which was solely directed against the emergence of Biafra as a sovereign nation which the governor vowed to never allow to take place under his watch. The report also said that Dave Umahi also warned that he would treat any IPOB member caught in the community as a common criminal to teach others some lessons. In another separate phone interview granted to Biafra Writers correspondent by another member of the community who craves anonymity, stated bitterly of the ordeals facing the members of the indigenous People of Biafra (IPOB) in Uburu community at the hands of the state governor. "Shalom to you my brother and good evening"
BW: Please may I know you? "My brother my name is not important here, I am just an IPOB member and a Biafran, no offences please"
BW: It is okay, I understand. So, how does being a member of IPOB feels like in Uburu? "My brother, it feels like hell down here! That we are constantly being disturbed during our family meetings by the governor's security agents is not only the problem, the real problem here is that our communities are under occupation by Fulani herdsmen who are living comfortably in all the bushes around and on our farmlands. Every day, they are seen going about their businesses with a kind of boldness that could make someone to wonder what is the source of this courage of theirs"
BW: Was the governor aware of this, I mean the heavy presence of these herdsmen as you complained? "Yes of course, it is the governor who gave them the impetus that they are free to rear their cattle anywhere they so choose as far as the community is concerned and promised to give them protection always"
BW: Has there been any record of violent rampage caused in the community by these herdsmen? "There was none, in our own community, but in Onicha community, some youths has dug up some weapons buried in the bush underground at someone's farmland so you never can tell what they may have in their coffers because of the way they are going about with these dangerous weapons which they are always seen moving freely with in every nook and cranny of our communities, their wives even do businesses here, they always go to our local markets selling stuff"
BW: So you mean they are going about with dangerous weapons, what kind of weapons do they always carry? "When you meet them in the bushes where we do our farming, they will be brandishing Ak47 rifles and other short guns but when they want to come out of the bush to probably buy something in the village, they will hide the guns and come out with daggers and matchets only"
"Please we are on our kness begging our Supreme leader Mazi Nnamdi Kanu to plan to visit Uburu community in order to liberate our people who are living in fear of the governor and his friends the Fulani herdsmen" he concluded. Recall that this very report comes barely a week after the IPOB through the Biafra Writers Forum warned the Ebonyi state governor to steer clear from the activities of the Indigenous people of Biafra in the state especially at Uburu community which he seemed to have grown deef ears to those warning thinking he was dealing with mere noise makers and jobless youths as they always refer to the IPOB members but forgetting that Biafra is a spirit that he cannot succeed. An Igbo adage says that an Ofeke enjoys the Egede dance but little did he know that Egede dance is the dance of the spirits. He who has ears let him hear! Any man who fails to dig out the precedents that lead to his father's death, may also be killed by the evil hands that killed his father. We advice that Governor Dave Umahi should ask questions from other state governors and other politicians who has in the past fought against Biafra in order to advice himself correctly afterwards. A word is enough for the wise. The Biafra agitator freedom restoration project is really bringing out all of the cowardice political prostitute harlot who have sold their birth rights to the Hausa-Fulani. 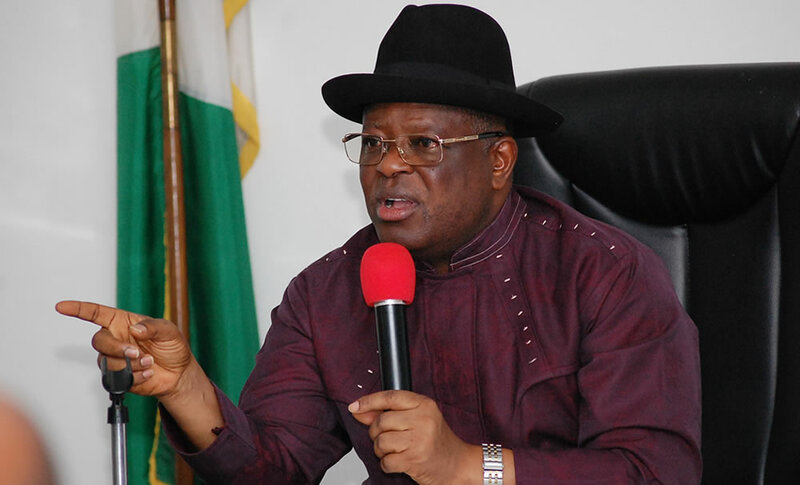 This so called governor harlot governor Dave Umahi should be pinned against the wall and shipped out of Biafra Land!! !